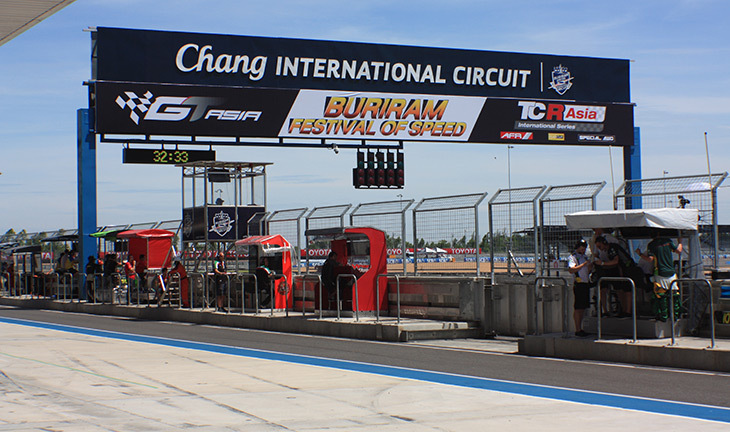 … The Chang International Circuit. So, I’ve spent the past three days getting fried and exhausted at the circuit. No complaints. It was a first class weekend. The circuit – in fact the whole complex – is something else. Hard to describe, but the first thing you should know is – it’s huge. I mentioned a few days ago that what you see from the main road is the restaurant complex. That has 20 to 30 fast food outlets. 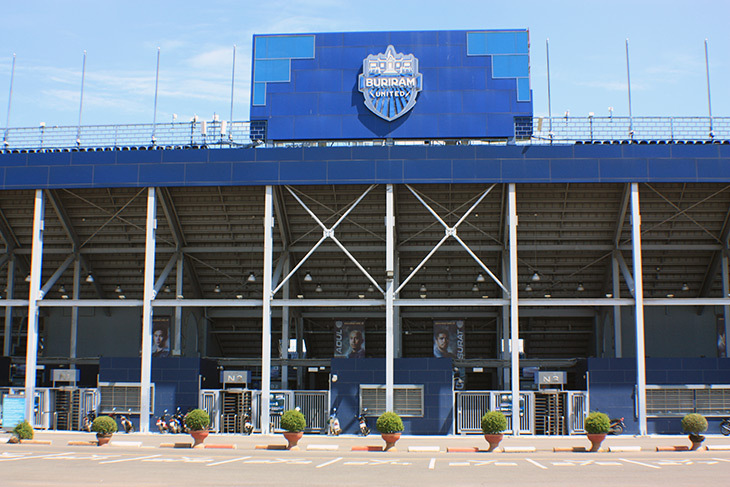 Then you see the main soccer stadium; that seats some 35,000 people. Behind is the race circuit, a full-length drag strip, a kart circuit, and a drift track. They all have their own grandstands and floodlighting. It’s all very smart, and that may be because it’s less than two years old, and in another ten it may look like the broken down dumps that could describe similar facilities that shall remain nameless. But somehow I doubt it. It is being constantly cleaned and maintained. I was amazed to see people washing and drying the grandstand seating. Where in the world do race circuit seats ever get washed? And the washrooms were immaculate. That has to be another first. As I was liberally splashing water everywhere to wash off the day’s dust and grime, there was a lady waiting to wipe up my errant splashings. It was more like being in a five-star hotel. There seem to be ten times more workers than you would find at most circuits. Security, cleaners, marshals, caterers, you name them, they have them. I was told that all of the workers who come into contact with the public, and they are all volunteers by the way, are obliged to attend a two course on how to deal with farangs. We must be a difficult breed. Of course, they have to take the course to work at the course! Oh, and I should mention that the whole complex is owned by one man. He must be something of a sports nut. A wealthy one. I had to chuckle on a couple of occasions. Walking around the huge area behind the grandstand, I suddenly found I was unable to move. I was surrounded by six policemen. WTF have I done now? Carefully I was maneuvered into a position where there were two policemen on either side of me, dusting off their jackets and making sure their hats were straight, while the remaining two policemen took photos. Then it was all change, so that over the next few minutes all six could be in the photo with the ancient farang. And yes, this happened twice. Oh well, I made someone’s day. The visit had a strange start. The poor guy who had made the arrangements couldn’t find me. Not surprising given the size of the place. He was at the main entrance, and I was already behind the pit complex, some 3kms away. That took a bit of sorting. He’d kindly arranged a VIP pass, but a VIP I am not. I didn’t want to spend three days in an air-conditioned room being fed and watered while watching the real action on TV. So the event organizer was found – someone I’ve known more than twenty-five years – and he decreed that a Media Pass should be issued. It took some bureaucracy and paperwork, but eventually it appeared. That was good news. With a Media Pass I could go anywhere. And I did. If I got hungry I reverted to being a VIP! Sneaky. For me, the best part was meeting up with old friends; and making some new ones. It seemed half of Malaysian motorsports was there. And many of those were fasting, which must have made it tough. Not being able to drink, while working your nuts off and sweating profusely, must be tough on the system. One friend told me he’d fasted every Ramadan for the past forty, and confided that it doesn’t get any easier. Heros. Oh, did I mention it was hot? On the second day I stood on the grid at midday as the cars lined up for the first of two GT Asia races. The Michelin tire man stood beside me, and bent over to check the track surface temperature. 57°C. And that heat was radiating upwards. It felt like someone was holding a hair dryer on maximum heat, right behind my neck. I’ve never experienced anything quite so hot. The bad news is, when I went back to the car, the sun had been shining directly on the windshield all day and had cracked it. General opinion was that it couldn’t expand enough in the frame, and decided to complain. I hope insurance will cover it. It was a strange reversal from having endured Canadian winters where, on truly cold night of -40, dashboards crack. I’ve seen ones completely split down the middle. I’ll stick with the heat thank you. So, all in all, a great visit. One I think I’ll have to repeat next year. If I’m invited. I have hundreds of photos to sort through, and I’ll get some into Twittering asap. I’m staying at the Khorat Resort Hotel, which is quite some distance from the town. It’s set in nice surroundings, a bit old but clean, and relaxing. I need to make an early start tomorrow to cover some 600+ kilometers, so being away from the town traffic seemed like a good idea. As far as I can figure, the only place to visit, aside from the pottery village, is something called the Khorat Fossil Museum. I decided to give it a miss, in case they figured they should keep me as an exhibit. Tomorrow night I get to see the sea for the first time in a week. Hopefully I’ll arrive in time for a walk on the beach. Stay tuned.